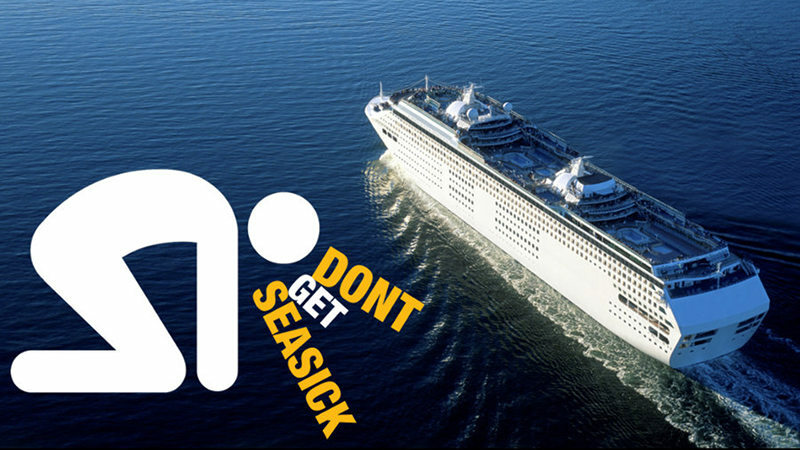 Scared of Sea Sickness on your Cruise?! 33 Tips & Natural Remedies to stay Healthy! Cruise Blog Scared of Sea Sickness on your Cruise? Here are 33 Tips, Natural Remedies & Medicines to save your Vacation! Scared of Sea Sickness on your Cruise? Here are 33 Tips, Natural Remedies & Medicines to save your Vacation! Motion sickness can ruin your cruise. Once it sets in, you can bid your vacation “bon voyage.” You’ll be bed ridden and wishing you were anywhere but at sea. And after the onset, sea sickness medicine has less of a chance of working effectively. Here’s how one follower describes her experience with sea sickness. I started feeling it on the second day of my cruise. We had a sea day and the waves didn’t seem too bad. But, I noticed the constant rolling motion early in the day. Within a couple hours, I felt terrible. I couldn’t make it to dinner that night or for the next three nights. I almost flew home port, but decided to battle it out. I don’t think I’ll ever cruise again for fear of going through that again. I can’t imagine a worse feeling. You’ve saved for months or years for your dream vacation. Then it’s gone. It’s worse than gone. It’s torturous. Well, we’re here to assure that doesn’t happen to any of our readers. Use the Pin It button to save these to your Pinterest Cruise board! Before we dive into the available sea sickness medicine and other options, let’s first understand what it actually is. Motion Sickness is still a bit of a mystery to those in the medial field. But, the most widely accepted hypothesis is as follows. When feeling motion but not seeing motion (like in a cruise cabin), there’s confusion. The inner ear tells the brain that there’s movement. But, the eyeballs tell another story. These conflicting signals set off a biological alert. Your body assumes that you must be hallucinating due to poisons ingested. As such, it wants to rid those poisons by inducing vomiting. The above is simplified as best as we could from Wikipedia. Below are the best tips to avoid or reduce the impact of sea sickness. Many of these are from the Ebook – Cruise Hacks: Ultimate guide to saving Time, Money & Hassle on your Cruise. A special “thank you” goes out to that amazing resource! Here are the best strategies to stay healthy and happy on your cruise. Below you’ll find a couple dozen ways to help prevent the onset of sea sickness. These involve no medicine, nothing to ingest, and nothing to buy. Simply follow these suggestions to reduce the chances you’ll get sick. While the ship is moving, you’ll want to focus on something that’s not. Staring off into the distant horizon allows you to focus on a constant and helps to stabilize your equilibrium. Odors can cause the onset of motion sickness. If you’re around perfume or other pungent smells, move to an area with fresh air. Sea sickness is very much mental. Try not to discuss or think about motion sickness. If anyone in your party or vicinity is getting sick, definitely avoid this at all cost. Out of sight, out of mind. Eating too much on your cruise can cause discomfort and can contribute to sea sickness. Try to eat healthy, avoiding fatty foods and too much sugar. Keep your head as still as possible. This is easiest if in a comfortable chair or laying down. The fluids in the head cause nausea, so keeping that stable helps to reduce the issue. The constant chewing motion can help relieve motion sickness. For extra protection, use one of the ginger gum products listed below. If you’re prone to motion sickness, consider avoiding alcohol. We know that’s tough, but consider the alternative. Booze can have the complete opposite intended consequence! Other natural motion sickness remedies include citrus, prunes, mints, parsley, sage, rosemary, thyme, carrot juice and apricot juice. You should be able to find several of these in your buffet, so give a few a try. Closing your eyes can help prevent the onset. Sea sickness is caused by conflicting senses and your body’s reaction. By shutting your eyes, you eliminate one of these inputs and help reduce this confusion. The redundant motion can contribute to the nausea. If it’s possible, change up the redundancy. If you have access to the captain, have him or her switch directions temporarily. If you can’t change the motion of your ship, eliminate it. By submerging in the pool, you’ll stabilize your body and eliminate the motions you’d otherwise feel. The smell of an orange rind has been known to cause instant relief from sea sickness. Just peel the orange, hold the rind up to your nose, and inhale. We’ve heard of this tactic from a few people that swear by it. As soon as you feel any signs of motion sickness, try a green apple! They should be readily available in the buffet and have been known to result in almost immediate relief. Mothers have been known to get seasick after having their first baby. We don’t really expect you not to have a kid, but just know that you may be more likely to get it after your first child. Staring at books and computer screens can cause that nauseous feeling and contribute to sea sickness. Go for the audio-books instead. Keep the air on in your cabin so it stays very cool. The cold temperature will counteract motion sickness. Warm air in your closed cabin will likely have an opposite impact. The front and rear of the ships tend to move significantly more than the ship’s center. Same goes for the sides of the ship. Stay as close to the middle of the ship as you can to avoid extra rocking. We advise getting your cruise cabin in the middle of the ship if susceptible. As previously mentioned, motion sickness is very much a mental issue. Occupying your mind on a task can help avoid its focus on nausea. Play a game, sport, or focus on an audiobook. This has been known to cause relief for some. We’re unsure of the science behind this, but it’s an easy method to try. Here’s another strategy that make many skeptical, including us. Putting your feet in an ice water bath has helped some. Stomach relief can come from carbonated drinks. Many have heard of drinking ginger ale for an upset stomach. It applies here as well. Use q-tips to clean your ears. Excess ear wax can cause motion sickness according to some resources. Make sure to take deep, controlled breaths to get oxygen into your system. Depriving yourself of oxygen can lead to dizziness and contribute to sea-sickness. Let it go (insert “Frozen” soundtrack). If you’re already past the point of no return and your stomach is very upset, consider “pulling the trigger.” Inducing vomiting has been known to cause immediate relief. Sleep plays an important role in general health and contributes to motion sickness. Make sure to get a full night sleep to reduce the chances of its onset. If you’re worried about getting sick and want to take an added precaution, these products might be for you. They’re all natural and homeopathic remedies that serve as options for relief of sea sickness. Ginger is known as a natural sea sickness medicine. It can be consumed in a number of different ways, including Tea, Gummies, Lollies, or the most popular, seen below. We’ve never personally tried this in the inhaler form, but have heard of great results from breathing in natural oils. This is the easiest way that we can think to transport and access aromatherapy. The inhaler easily fits in your pocket or purse and can offer almost immediate relief. The scents will distract your other sensory receptors and hopefully alleviate the nausea. Here’s the best rated aroma inhaler on Amazon. 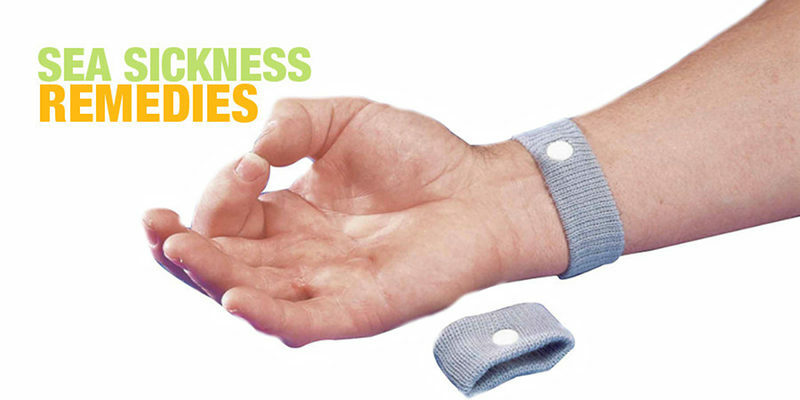 These wristbands are made to activate a pressure point shown to reduce sea sickness. In Chinese medicine, this point is called the “sixth point on Pericardium pathway.” You can also activate it with your thumb and forefinger, but a wristband is good for a consistent source of alleviation. Sea-Band is the most well known brand we’ve seen in this space. We’ve heard people swear by this product. If curious, just read some of the glowing reviews available on Amazon. This option is also all-natural and said to provide no side effects. It’s small and convenient for travel. It’s been hypothesized that a lack of Vitamin B contributes to sea sickness. A test was actually conducted on pregnant mothers, who took 25mg per day of Vitamin B and saw a significant reduction in vomiting and nausea versus a controlled group who did not take the vitamin. And it’s relatively cheap on Amazon and has great ratings. If you’re really scared of getting sick at sea, it might be good to keep one or two of these on hand. We suggest that you consult your physician before ingesting anything, but all are over-the-counter so we feel fine recommending them as a solution. We’ll let the FDA handle the rest. The magic in this product is, “meclizine hydrochloride antiemetic.” On drugs.com, it’s said to be over-the-counter and for the purpose of curing nausea, dizziness, and vomiting. The reviews on Amazon look legitimate, while we’ve never personally tried this product. Like Zentrip, the active ingredient is “meclizine hydrochloride antiemetic.” Unlike the item above, this product is offered in raspberry chewable tablets. If needed, these might be a better option for kids. The product has good reviews in Amazon and “Bonine” is a reputable brand in the industry. Dramamine is probably the most common anti-nausea seasickness medicine on the market. For many, this option causes drowsiness, which is why we recommend taking it before bed rather than prior to an active cruise day. The active ingredient in Dramamine Original is “Dimenhydrinate.” According to Drugs.com, this is an over-the-counter antihistamine and anticholinergic to reduce nausea, dizziness and vomiting. Due to those big words, we’d recommend contacting your doctor if planning to take. Or use Dramamine’s natural ginger version found here. When walking around your cruise ship, you’ve probably seen people with these behind their ears. Cruisers that have used the sea sickness patches swear by them. We’ve heard many say that they cause immediate relief and have saved their cruise. For the price, it’s probably not a bad idea to have them on stand by. Find them on Amazon here. We hope that the above suggestions help. If you’re prone to this malady, we wish you the best of luck on your cruise! Remember the tips and suggestions and pack a couple of the natural and medical options as backup. If you found this post useful, please use the buttons below to share! Have always had motion sickness since I was a child, but I find that ginger root capsules work wonders while I am cruising. I have very bad motion sickness got it after I had my first baby and never went away so I use the ear patch and sea bands and was great on the ship no problems been on 3 curuise no issues.